What does the inspired Bible say? Detailed theological refutation of 20th century tongues that proves tongues ceased sometime around 100 AD. Gifts cease when the "Perfect comes"
"One of the pillars of the cessationist position is that only apostles can perform miracles." Cessationists do not teach this! In fact such a position is ridiculous since Philip was performing miracles and signs in Acts 8. The truth is that ONLY APOSTLES COULD TRANSMIT the gifts through laying on of apostles hands! See Acts 8:14. 1 Cor 13:9 "if there is knowledge, it will be done away" How could do away with knowledge in the first century when we still have knowledge today! What is done away with is "miraculous knowledge" The supernatural impartation of knowledge to a man directly through the Holy Spirit was one of the 9 spiritual gifts listed in 1 Cor 12. It is amazing that many Pentecostals will say "knowledge is of the Devil, God will do away with all knowledge at the second coming." Pentecostals are notoriously "anti-theological and anti-intellectual" worshipping at the alter of their feelings! There have been groups all down through history who have spoken in tongues, prophesied and performed miraculous healings like the Quakers, Shakers, the converts of Wesley, the Irvingites, the Jensenists, Waldenses, the Albingneses. Most of these groups would be considered dangerous cults by modern Pentecostals. How do Pentecostals account for the Holy Spirit working within these cults? 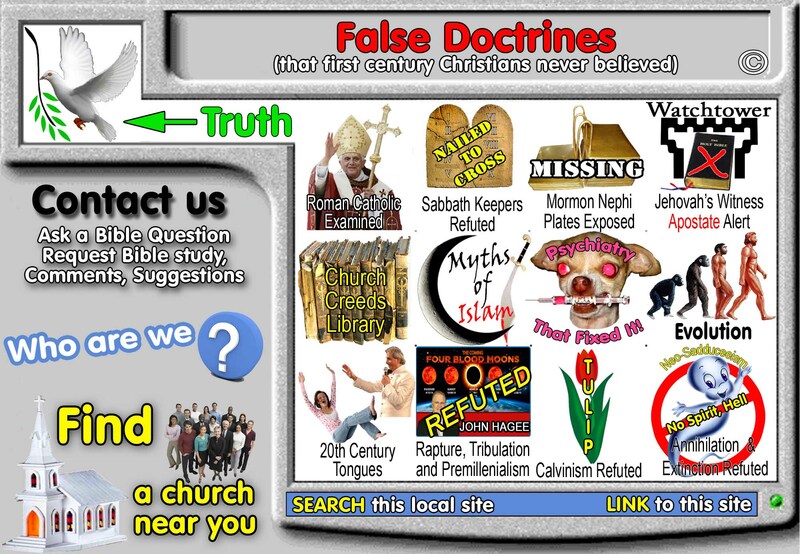 When Pentecostals refer to history, they conveniently overlook the Mormons, the Jw's, the Seventh-day Adventists in their list even though all of them claimed to either speak in tongues, or possess the gift of prophecy or have the direct guidance of the Holy Spirit. The shakers, for example, would be considered occult today by all Pentecostal churches. The shaker founder, "Mother Ann Lee" claimed to be the messiah! If only Pentecostals spent more time studying truth than emotionalism, they would have known this! Now that they know it, on what basis can they separate themselves from the Shakers since both exhibit identical manifestions! John Wesley said: "Spiritual gifts are for this day and the only reason for their scarcity is that Christians have become heathen again, with only a dead form left"
This is a common slur that Pentecostals label upon any church that does not claim 20th century tongues. They call such churches, "dead, lifeless, spirit lacking churches" ... all because they do not roll around on the floor making fools of themselves then blaming it on the poor Holy Spirit! We call it "spiritual Aryanism"
Wesley, like his grandchildren in the Pentecostal churches today, confused emotionalism for the presence of God! Should this really surprise us? Wesley is the founder of the Methodist church. Notice that Wesley believed in continuing revelation, just like Pentecostals today, yet there is no record of Wesley himself speaking in tongues or exhibiting any of the powers of the Holy Spirit!" The Wesleyan doctrine of perfectionism, logically leads to Pentecostalism. This is proven by the rumor that some of Wesley's converts spoke in tongues! The presence of spiritual gifts in a church are a sign of spiritual maturity that ungifted churches are lacking! Same old "spiritual Aryanism" slur Pentecostals label non-charismatic churches with. "We are more mature and just plain closer to God than you." Sometimes proponents of current charismatic activity claim that having spiritual gifts is a mark of Christian maturity. Nothing could be further from the truth. The church in Corinth had more in the way of spiritual gifts than any other as far as we have record. Yet it was a church plagued by factions, law-suits, fornication, skepticism and abuse of the Lord's table! Paul said they were not spiritual but carnal (1 Cor 3:1) and told them to quit being "children in mind" (14:20), a condition aggravated by their in-ordinate use of tongue-speaking! Paul's illustration is to point out that just as he left behind childish ways when he grew from infancy to manhood, so also the infant church would no longer have spiritual gifts when revelation is complete. Jesus "gave gifts unto men" so that the word might be correctly set forth through the apostles and other divinely aided teachers (v. 11) to build up the body (v. 12) until it arrived at "the unity" (wholeness) of "the faith" (the New Testament content) and the wholeness of the (full) "knowledge" (epignosis) of the Son of God "unto a full-grown [teleios] man" (v. 13). Thus, when the revelation became "perfect" (teleion-1 Cor 13:10), the body of Christ also became "full-grown" because Christians were protected from doctrinal "error" (Eph. 4:14) and were able to speak "the truth" (v. 15). When the full revelation was given, the church could then "grow up" (v. 15) and reach the status of "man" (v. 13). Being "no longer children" (v. 14), the body of Christ put away "the things of the child" (literal reading of l Cor. 13:11). The formerly infant church was finished with miraculous gifts. The "perfect" refers to LOVE. When we learn to love perfectly, then the gifts will cease. After all 1 Cor 13 is called the love chapter of the Bible! Some have affirmed that love (Christian maturity) is what "that which is perfect." refers to. A proper exegeses of 1 Corinthians, chapters 12,13 &14 will show that love is actually an interjected thought apart from the overall message. Chapters 12-14 are about spiritual gifts: Ch 12 = defining the 9 gifts; Ch 13 = gifts will cease; Ch 14 regulating the use of gifts. Love is not the central theme of this section but a side thought! These views ignore the immediate context of verses 8-13 (a contrast in duration rather than value), and they also ignore the definitive statement of verses 9 and 10 (a contrast in quantity). One writer goes all the way back to I Corinthians 2:6 for the premise of his maturity argument, completely missing the point of 13:9-10 in an unsuccessful attempt to define the contrast in terms of quality (maturity versus imperfection) rather than quantity (totality versus partiality). Some seem to think that the purpose of spiritual gifts was to mature the love of Christians. But notice: (1) The gifts of prophecy and knowledge were for the purpose of providing information (1 Cor 13:2; 14:3-6, 19). (2) Tongues were a sign to unbelievers (14:22). (3) The spiritual gifts of the Corinthians were contributing to personal immaturity rather than maturity (3:1; 14:20). (4) Spiritual gifts were needed because the early church was "childish" in its level of knowledge (13:11), not in attitude. (5) Paul was certainly mature, but he still had spiritual gifts (2:1-6) and spoke in tongues more than the Corinthians (14:18). (6) People today are just as immature and unloving as ever (maybe more so), yet spiritual gifts have ceased. Why? Nowhere does Paul so much as hint that supernatural gifts were given to the church because Christians were unable to love each other! In the miraculous age of the first century, Paul wanted them to have love and gifts (12:31; 14:1). "Perfect" is neuter gender; "Christ" is always masculine gender. Does not say, "when He who is perfect comes" but "when THAT"
Perfect refers to a thing, not a person and certainly not Christ. Jesus is a person, not a thing! The Greek forbids this interpretation. "Perfect" refers to the second coming or our perfection in heaven. Neither heaven nor eternity is mentioned anywhere in this context. We have already proven that gifts must cease before the second coming and that faith and hope must abide LONGER than the gifts. Such facts Pentecostals cannot account for without employing an unbiblical definition of faith and hope that extends them both into all eternity. Doesn't this view make Jesus' promise in John 16:13 look rather meaningless? 'You shall be guided into all truth. and yet, only the very last generation at the end time will really be in possession of all truth.' ? Logically "that which is perfect" must refer to the completeness or perfection IN THE SAME REALM as that referred by the phrase "in part" (13:9). And seeing that "in part" refers to the revelation of God's will, that which is perfect must contextually refer to the complete revelation of the will of God. When the NT was complete, the means to reveal it (prophecy, knowledge) and confirm it (healing, miracles, tongues, etc..) where not longer needed. Such makes perfect sense. A body of truth would be revealed (John 16:13), it wouldn't be a limitless supply (seeing that no man could comprehend or obey such a limitless and never-ending body of truth). Logic demands that eventually all truth was revealed. At which point, the gifts no longer were needed. OK gifts did cease, as history proves, but there is a second outpouring, "latter rains" prophesied. When they cease, they cease! Various Pentecost groups have claimed a "second outpouring of the Spirit" (a second Pentecost) in the twentieth century. A rebirth or revival of spiritual gifts. Such contradicts verse 10. Such appeals to Joel 2 for latter rains are nothing more than irresponsible Bible interpretation. A simple reading of Joel 2:23-25 proves that the context has nothing to do with a second spirit outpouring, but a common figure of abundant harvest. "For He has given you the early rain for your vindication. And He has poured down for you the rain, The early and latter rain as before. And the threshing floors will be full of grain, And the vats will overflow with the new wine and oil. "Then I will make up to you for the years That the swarming locust has eaten"
This "latter rain" false teaching actually admits that gifts did cease for over 1500 years! One minute Pentecostals say, "gifts are manifest all down through history" the next breath they say, "they ceased for 1500 years but the Bible promises a second outpouring"! Again, typical of Pentecostal Bible interpretation methods. "I shall know fully" refers to judgement day or life in heaven. "then I shall know fully just as I also have been fully known" in v 12b are from the one Greek word, "epiginosko" and is a different word than that used in v12a and v9, "know in part"
Some say that our knowledge of God is incomplete right now, but will be perfect at the second coming. Such is to claim equality with deity, and to know the mind of God as well as the Holy Spirit knows God. "Who has known the mind of God EXCEPT the Spirit who is from God?" Even in heaven, only the Holy Spirit will have a perfect knowledge of God! The second part of verse 12 is also a commonly misunderstood statement. Some think "then" points to eternity as the time of fulfillment. Even some who deny the genuineness of current charismatic activity see heaven in the statement because of misreading this as another illustration. One reason for this is that translations later than the KJV insert a word such as "fully" into the statement to represent the Greek construction. For example, the ASV reads, "Now I know in part; but then shall I know fully even as also I was fully known." The reasoning is that this must point to heaven since we can never know fully in this life. The argument is wrong, but the ASV rendering is valid. Paul used two different Greek words for knowing. "I know" represents the ordinary word ginosko, whereas "I shall know" is from the intensified word epiginosko. This latter word means to know "thoroughly ... accurately . . . well" or "exactly" or "completely. " The word speaks of thorough knowledge but does not necessarily imply flawless understanding. There is no warrant to picture here a scene when this world shall have drawn to a close and the faithful are all in heaven receiving full and satisfying answers to all perplexing questions. Let us notice how the word epignosko is used in the New Testament for the here and now. We can "know fully" false prophets (Matt. 7:19), the certainty of Bible teaching (Luke 1:34), the ordinance of God (Rom. 1:32), the things Paul wrote (1 Cor 14:37), the grace of God (Col. 1:6), the truth (I Tim. 4:3), and the way of righteousness (II Pet. 2:21). And with the noun form of the word we are told that we can have a thorough knowledge of both God and Jesus (II Pet. 1:2). All of these passages tell us that Christians are able to "know fully" right now in this life! Paul made no allusion to some greater knowledge to be gained in heaven. He simply wrote in contrast to the era of spiritual gifts when revelation was still incomplete and he only knew "in part." Yet he looked forward to the day (if he should live that long) when he would know all of God's revealed truth. He would then be able to know it '/fully" or "well" just as Paul already was "fully known" or "well known" (same word, epignosko) by others (1 Cor 13:12; I1 Cor 1:14; 6-9). The claim that one cannot "know fully" in this life is without scriptural basis and out of harmony with the usage of this term in the New Testament. The phrase, "face to face" refers to personally seeing God at judgment. Paul does not say we are going to see God, nor is there any mention of heaven. Such is totally assumed! The written word is referred to as a mirror in other places: 2 Cor 3:18; 4:6 Behold Jesus face in a mirror; Jas 1:22-25 look into mirror of the perfect (teleion) law of liberty. Some cessationists make the false argument that the word perfect teleion in 1 Cor 13:10 refers directly to the word law (James 1:25). The words translated "perfect" teleion in either the nominative or accusative case of the neuter gender or the accusative case of the masculine gender (in the singular number in all three instances) have the same spelling in all three instances. It is a contextual problem to determine which one of these three is the proper usage of the word teleion The word perfect teleion (James 1:25) is in the accusative case of the masculine gender, agreeing with the word law vouos. The adjective and the noun to which it refers should be the same gender. This argument implicitly denies the verbal-plenary inspiration of the Scriptures, as do all arguments that require the neuter teleion to refer to either a masculine or a feminine substantive. The figure in 1 Cor 13 is this: NOW'. revelation is partial and the mirror gives a dark view. THEN: revelation complete and the mirror will be as clear as seeing Christ face to face. This is a powerful statement about the all-sufficiency of scripture. The problem with this interpretation is twofold. First, "face to face" is an adverbial phrase; it does not have an object. Second, "face to face" is contrasted with a "dim mirror." Since "face to face" is adverbial without an object, the idea that it refers to Christ must be assumed or inferred. And since Paul has been contrasting forms of revelation throughout verses 8-12, it makes much more sense to interpret "face to face" in the sense of clearness (or perspicuity), in contrast to the dim mirror (the incomplete or piecemeal). Many have misunderstood "that which is perfect" because of misinterpreting verse 12. Paul now explains the illustration he just gave (notice the word "for"). Because of some figurative language here people often see heaven in this verse, but it is not there. To see in a mirror was a figurative expression which meant "to receive revelation from God." The word "mirror", in Hebrew is basically the same word as "vision." In contrast to other prophets who had to depend on the "dark speeches" of a vision or a dream, Moses received a "mouth to mouth" (clear) understanding of God's will (Num. 12:6-8). Certain rabbis in Jewish history said the prophets saw God in clouded mirrors, whereas Moses saw him in a clear one. In like manner, Paul says that while revelation is still incomplete "we see in a mirror darkly" (ASV). The mirror is clouded or obscure in some way. The word for "darkly" literally means "in an enigma." But later, when all spiritual knowledge and prophecy were to be finished, the image would become clear-"face to face." It is not the mirror that is done away but the obscurity or cloudiness of it. "Face to face" indicates the clarity of our understanding. We must still learn God's will through his revealed word, but because partial truth was finally finished we are able to see it clearly. The expression is not to be understood literally. Jacob, Moses and the Israelites were all said to have encountered God "face to face" (Gen. 32:20; Ex. 33:11,17-23; Deut. 34:10; 5:4-5), yet God told Moses, "My face shall not be seen" (Deut. 34:23). This demonstrates the figurative nature of the expression "face to face. " Likewise, Paul refers not to our seeing the face of God in heaven, as will eventually be true (I John 3:2; Rev. 22:4), but rather to the here and now as "with unveiled face" we behold "as in a mirror the glory of the Lord" (2 Cor. 3:18). We can now look into the "mirror" of "the perfect law of liberty" and "receive with meekness the implanted word" Jas. 1:21-25). That mirror reflects "face to face" now that God's word is finished. see also: Jer 32:4; 2 John 12; 3 John 14. Looking at the text in Numbers, we see that the background is that there had been an outburst of prophesying (Numbers 11:24-27) and well as Aaron and Miriam questioning and challenging the authority of Moses (Numbers 12:1-4). They claimed that God has spoken to them as well. Here we see the contrast between ordinary prophets , who knew the Lord through visions and dreams and Moses who had direct conversations with the Lord as well as received revelation "face to face". The ordinary prophets do receive partial, fleeting and somewhat obscure revelation. But Moses, the writer of the first five books of the Bible received revelation that was clearer and fuller, as opposed to the other which was "in part". Note that the "face to face" experience was very much on this Earth and that the contrast was between two types of revelation , both infallible , but one far more complete and clear than the other. In other words "face to face" encounter meant clear revelation. At the close of Moses' life the phrase "face to face" is again used to describe not the heavenly bliss into which he had undoubtedly entered, but his position as the great prophet who had clear revelations from God. But we have to admit that in the Old Testament, it is the contrast between partial and fuller revelation and not as the case in 1 Corinthians 13 which is the contrast between partial and final revelation. Nevertheless the contrast is there. Moses was the one who had written down the Word of God, and whether he used earlier records or not is immaterial. Through his ministry came the complete , written revelation in his day, and the phrase that characteristically depicts him in the role is that he saw the Lord "face to face". Mirror comparison fails because James was written before 1 Corinthians and the perfect law is most likely referring to the OT Scriptures. If the law (Scriptures) is perfect in James why is it partial and still to come in 1 Corinthians 13? 2 Tim 3:15-17; James 1; Psalm 19; all speak of the completeness and all-sufficiency of revelation before the completed canon. "But one who looks intently at the perfect law, the law of liberty" James 1:25; The perfect law of liberty in James refers to the new covenant, not the law of Moses. Although we are reasonably certain that 1 Corinthians was written around 54 AD (shortly after the second missionary journey of Paul) neither the date of James or even the details of the author (James who?) are known. This is a very uncertain argument. There is no compelling reason based upon internal evidence within the book to date the book of James before 1 Corinthians. Yet, the old testament law was called perfect! "The law of the Lord is perfect, restoring the soul" Ps 19:7 Yet it was only a partial revelation. However, even if James was written before 1 Corinthians, it still makes no difference. James 1:25 [referring to new covenant] and Ps 19:7 [referring to old covenant] are speaking of the overall codes of law, not their actual state of revelation. Psalms was written 300 years before Isaiah wherein are many unique prophecies of Jesus. Yet the Old testament was able to fully furnish us as a complete revelation: 2 Tim 3:15-17. Likewise James was certainly written before many of the other new testament books like Revelation, yet the "law of Christ" was complete. 1 Corinthians (unlike James 1:24 & Ps 19:7) concerns itself specifically with actual stages of revelation of this "perfect law". The perfect law of liberty only existed in an immature form (in spoken form or by inspired men and women). A person is the same person when he grows up that he was when he was a child; he has merely matured. What one sees in a metallic mirror is the same image he sees face to face; the form is clearer (more mature, complete, or better developed) when it is seen face to face. There was a qualitative difference between the message of the will of God when it was being delivered orally and when it was finally in a mature form (in written form). Quantitatively the message was complete, but qualitatively it was immature until it was in written form. This author does not claim that the perfect is explained by James 1:25. In James 1 the individual is looking at his face in the mirror and then looks at the Scriptures. The perfect law is contrasted to the mirror, not identified with it. James 1 is like a parable. Call it the "parable of the mirror". A parable [literally: "to throw beside"] takes two things and lays them side by side for comparison sake! First the physical illustration, then the spiritual application. All parables follow this structure. Hear now the "parable of the mirror"! We are all familiar with how we primp and preen ourselves every morning in the mirror. Well the spiritual application of the parable is that we can primp and preen our spiritual life by looking at ourselves in the mirror of the scriptures! There are two mirrors in James 1: a common physical bathroom mirror made of polished brass and 2. A spiritual metaphoric mirror made of God's word! This view is also too specific and anachronistic in referring to Paul and the Corinthians having an understanding that there would be a canon. At least it is unrealistic to see Paul as knowing whether or not the Scriptures were complete. Pentecostals who argue this fail to realize that this is exactly the same argument that Roman Catholics use to sustain their view that there was no fixed canon until the 5th century, when the Catholic church graciously gave the world, for the first time, the Bible! Such is utter lies and deception on the part of Catholic leaders! Paul certainly knew he was compiling a canon. Col. 4:16 And when this letter is read among you, have it also read in the church of the Laodiceans [ie. Ephesians]; and you, for your part read my letter that is coming from Laodicea [ie. Ephesians]. 1 Thess. 5:27 "I adjure you by the Lord to have this letter read to all the brethren." Notice 1 Cor 4:6 "Now these things, brethren, I have figuratively applied to myself and Apollos for your sakes, that in us you might learn not to exceed what is written" here we have Paul commanding the Corinthians to abide with the written revelation DURING the time when oral revelation was still genuinely happening! There are many passages that speak of gifts being available for all believers. Mk 16:17,18 "These signs will follow those who believe"
Acts 2:17.39 "our of Spirit upon all flesh" "many as Lord calls"
Mt 4:6,7 Satan quoted Bible, Jesus relied, "On the other hand it is written." Mk 16:17,18 & Acts 2:17,39 are qualified and limited by 1 Cor 13 & Eph 4. With all the present day religious division, we have not yet attained to the unity of the faith. We need gifts to bring about this unity today. The completion of Bible is what brought about the unity of the faith Prior to this time God's will was not fully written. 1 Cor is an excellent example of written revelation bringing about unity. The Corinthians were affected by winds of doctrine because the Bible was not yet written. Paul's first letter to the Corinthians actually corrected a large number of problems, even though they had spiritual gifts! It was the written word, not the supernatural gifts, that brought about unity in Corinth! This unity was achieved. There was only one church in the 1st century. Today we have hundreds of churches. Unity is at all time low and getting worse. "Spirit led" Pentecostal churches are divided against each other today! United Pentecostals even make tongue speaking a condition of salvation Is the Holy Spirit revealing conflicting doctrines to these "Spirit led" churches? We agree with this statement completely and reply: If you were to lock a brand-new Christian in a room with a Bible and tell him to study what the Scriptures have to say about healing and miracles... he would never come out speaking gibberish (tongues) or be slain in the spirit or claim to perform miracles either! Speaking gibberish and being slain in the Spirit are not even found in the Bible but are a learned, programmed action that only occurs after someone sees it happen to someone else! Such unbiblical events are then taught as the norm then people expect the same to happen to them! "Experience" and observation, is the most powerful argument against 20th century tongues. We have attended MANY Pentecostal meetings: "signs and wonders revivals", "healing meetings" etc and see people twitching, shaking, falling down, rolling around on the floor screaming and making fools of themselves (and blaming it on the Holy Spirit) BUT WE NEVER SEE ANYTHING SUPERNATURAL. People claim to be prophesying, claim to be healed, but it is all by faith! We don't actually see supernatural events, just claims of such! Being "slain in the spirit", for example is claimed to be the result of the Holy Spirit, yet some one falling down is absolutely NOT supernatural. While we agree that a major proof that Pentecostals today are deluded by thinking they possess the same spiritual gifts of the first century, we deny that cessation cannot be proven from the scriptures. This paper proves it beyond doubt! Ephesians 2:20: clearly says that there will be prophets and apostles in the church at all times: "having been built upon the foundation of the apostles and prophets, Christ Jesus Himself being the corner stone,"
Although the church today has no living apostles or prophets in her midst, she not without apostles or prophets! The 12 apostles of the first century are laid in the foundation once for all time just as Jesus Christ is the corner stone, yet he does not walk amongst us any more. If this verse teaches that we must have apostles or prophets walking amongst us today, then it also teaches that Christ, the cornerstone, must be walking amongst us as well! How blasphemous that most of the key leading Pentecostal TV preachers today take on the title of "apostle", claiming to have the identical authority with Paul and the twelve. It is likely Paul deliberately paralleled 1 Cor 13:8-13 to 1:4-8 in order to reinforce the idea of the continuation of the gifts until Christ's coming. Paul used "perfect" [teleios] of 1 Cor 13, in reference to the second coming in: 1 Cor 1:8. A simple reading of these corresponding sets of verses will reveal the difference in meaning! God doesn't change: Mal 3:6; Heb 13:8; therefore we should expect to speak in tongues today! This is a ridiculous argument that says more about the quality of Pentecostal leaders to properly interpret the Bible than their false doctrine itself! Seventh-day Adventists use this identical false argument in order to incorrectly prove that we must keep the weekly sabbath [Saturday] even though Col 2:16 clearly states it was abolished at the cross. "God doesn't change" they say, "Jesus kept the sabbath so we must too!" Why did no one speak in tongues BEFORE Pentecost? Did God change? Why do we not still circumcise and offer animal sacrifices? Did God change? Why did no one before Sinai (Ex 16) ever keep the sabbath? Did God change? Why does God say the sabbath is now abolished in Col 2:16? Did God change? Why are there no longer any levite priests after the Aaronic priesthood? ANSWER: Hebrews 7:12 say: "For when the priesthood is changed, of necessity there takes place a change of law also." Did God change? ANSWER: God's law, and how he works with man changes, but God's nature and character never changes! ANSWER: God has worked in different ways at different times with his people all down through history: Heb 1:1-2 " God, after He spoke long ago to the fathers in the prophets in many portions and in many ways, 2 in these last days has spoken to us in His Son"
The Hebrew word "olam" (forever, perpetual, everlasting, eternal, permanent) is used in reference to all these things that have now been abolished: Jewish Passover: Exod 12:14,24 ; Day Of Atonement: Lev 16:30-31 ; Feast Of Tabernacles: Lev 23:41-42 ; Tabernacle Candles: Lev 24:2-4 ; Tabernacle Showbread: Lev 24:5-9; Levitical Priesthood: Exod 29:7-9; Animal Sacrifices: Lev 7:36-38; Deut 12:27-28; Ex 29:42. Likewise gifts were stated to "follow them that believe", but this is limited by 1 Cor 13:8-13 which says they will cease at the completion of God's revelation. This passage clearly sets the duration as "age-lasting" within the apostolic age between 33 AD - 100AD! The principle of one verse modifying another is seen in Jesus reply to the Devil after he quotes a valid scriptural point to Jesus and Jesus replies: Mt 4:7, "On the other hand, it is written" This proves that one verse of scripture can modify another! How can we know whether someone is ordained to preach the gospel? We ask, "ordained by whom"??? God or man? and HOW??? This question is rooted in denominational thinking, foreign to the Bible and brings to mind all kinds of questions like apostolic succession and the clergy/laity distinction found in most denominations. Ordination is nothing more than a legal employment contract by which a human origin centralized church government, is able to control its preachers in every pulpit from one central point. Such centralized organizations are totally unbiblical and absent from scripture. Does a piece of paper, a university degree, a nice church ordination service, prove some one is ordained by God? Does a person walk up and say, "I heard the voice of God telling me I am supposed to preach?" Should we just take their word for it? Must someone else get some prophetic message about the person to confirm it? How do you account for the wild heretical false doctrines that many leading Pentecostal preachers on TV teach, while they claim to be directly hand picked apostles of Christ? Biblically all Christians are ordained to preach based upon Mt 28:18-19. Every Christian knows he is ordained to preach, not by direct revelation or piece of paper issued by world headquarters, but by the words of Christ in the Bible. I have seen miracles with my own eyes! the proof of the miracle is based 100% on the testimony of the person healed. "You can't tell, but I had a pain that is now gone"
the miracle happened somewhere to someone in southern Bolivia, but no specific details! This proves nothing! Show us, don't tell us! Name the man! Name the preacher! Let us attend your miracle revival so we can see for ourselves! Confirm to us that you are in the midst of apostles and prophets! How do you account for the fact that Jw's, Mormons, Catholics, Seventh-day Adventists, Hindu gurus all claim to perform miracles? If miracles have ceased why would be pray? Because God told us to! See James 5:14-15. If gifts of the Holy Spirit are required to pray, then why would an ungifted man pray? Answered Prayer and miracles are two very different things. God always has and always will answer prayer and providentially work behind the scenes with his people. Praying to God for safe travel or employment is answered by God directly intervening in our lives, but ALWAYS WITHIN NATURAL LAWS. If you pray for a job, then a man phones you up one hour later and offers you a job, God is behind it, but it IS NOT A MIRACLE. The Bible definition of a miracle is an event man witnesses that transcends the laws of nature, supernatural! Childbirth and snowflakes are not miracles, but 100% natural processes fully explainable by science! Science can never explain a miracle! Jas 5:14-15 is a promise of miraculous healing for us! James is a promise of providential healing through prayer! The expression, "anointing him with oil" refers to "use the medicine of the day". Lk 10:34 "bandaged up his wounds, pouring oil and wine on them" another reference is in Mk 6:12. The context of the entire passage is the power of prayer, not some miracle worker. This promise applies to all Christians, not just to those gifted with the power to perform miracles. Gifts were a temporary; "scaffolding" till the church fully established. Rom 10:1-3 Pentecostals are zealous but not according to knowledge or truth. Jn 14:11,12 preaching the word to the lost is greater than miracles: Rom 1:16 achieved. There was only one church in the 1st century.